Strong user authentication is becoming a new standard for security and compliance. In today's IT environment, passwords are no longer a sufficient method for controlling access to sensitive data. The power of any authentication method - and one of the reasons why passwords have become so popular - comes from the number of applications and purposes it supports. Users' identities do not change when they unlock their encrypted laptop, remotely connect to the network VPN, or log onto enterprise applications. IT managers should expect alternative authentication methods to support such flexibility and offer broad interoperability. This is why best practices recommend adopting solutions that provide broad support across platforms, applications and credentials. 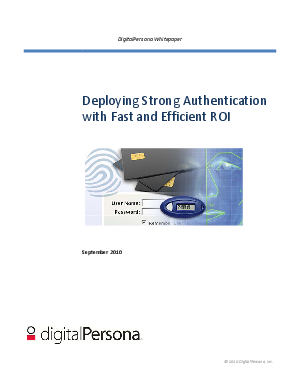 This whitepaper outlines the problems of traditional password-based authentication systems, and sets out best practices for implementing strong authentication systems that are secure and easy to use.